Unemployment at 9.1 Percent: Heckuva Job on that Stimulus, Mr. President! Based on this morning’s numbers, I’ve updated my chart showing what the Obama Administration said would happen with the so-called stimulus compared to what actually has happened. As you can see, the unemployment rate is about 2.5 percentage points higher than the White House claimed it would be at this point. Since I just did an I-told-you-so post about Greece, I may as well pat myself on the back again (albeit for another completely obvious prediction). Here’s the video I narrated a couple of years ago on the Obama faux stimulus. Can unemployment ever be 0%? Based on my minimal economics schooling 3 to 5% maybe the best number. Recall that 4.5% unemployment just wasn’t good enough for the MSM. on June 4, 2011 at 6:04 pm Art R.
The ever-smiling Christina Romer, the former head of our President’s Council of Economic Advisors, convinced him that a big application of Keynesian economics would be just the ticket to get us out of this predicament. If this were the 1950s or 1960’s, no doubt the $800 billion plus stimulus (inflation adjusted, of course) would have turbo-charged our economy. That’s when we made just about everything here. Now skip to the present. Suppose you drive a dump truck transporting hot asphalt from the batch plant to the paving machine on a roadway reconstruction project financed with stimulus money. You’re paid the “prevailing wage” and rack up lots of overtime. At the end of the month after taxes and necessary expenses, you have several thousand dollars left to burn. How about that big stainless steel barbeque at Lowe’s (made in China); the high-def flat screen TV at Best Buy (made in S. Korea); a pair of exquisite calf skin shoes at McCreedy & Schreiber in NYC (made in Italy); a pack of men’s white cotton briefs at WalMart (made in El Salvador) or maybe put a down payment on a Prius at your local Toyota dealer (made in Japan). Get the picture? The stimulus money eventually wound up stimulating those economies where the products that we consume are manufactured. All we got out of the stimulus were some overindulgent consumers and a mountain of new debt. 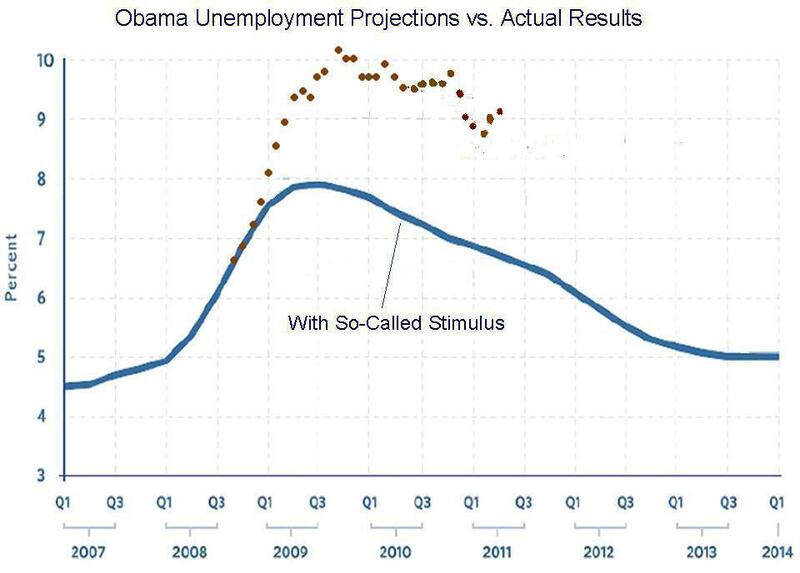 My favorite line to add to this would be the white house projection of what unemployment would be without the stimulus. I’m not sure about the current date, but I do know that for a while actual was above even that. I see somebody else commented on this last time you posted your chart though. As an addition or alternative to Adrian Scott’s suggestion, you could overlay the labor force participation rate–which should nicely illustrate his second point. As to Charles point, a comparison between the growth (rate of change or net increase) in debt and the growth in GDP should illustrate the success or, more likely, futility of the keynesian spending splurge. An interesting overlay to this graph, with Dr. Scott’s additions, would be the increase of national debt. Spend more and get less out of it? A total waste of money depsite what the Keynsians proclaim. on June 3, 2011 at 9:29 am Adrian Scott, Ph.D.
1. It really would be better to start the y axis of the graph at 0, imho. Otherwise the changes are magnified if one tries to draw percentage change inferences just from vertical distance in the graph.